Marcilia was born from the same dream of two souls in love with the sea. Marcial and Cecilia, we worked for more than 10 years in a European Cruise Ship Company, we knew each other as friends until the flame of love joint us together, immediately we notice we had many things in common: the passion for our jobs and specially the love for the sea that was the witness of our trips around the world, we decided to marry and start to make our dreams come true. Our passion for the Culture of Service made us create MARCILIA, a place that only in dreams we had imagined, we were in love with the sea and beautiful beaches that we could only enjoy for a few minutes around the world, now we have the pleasure to invite everybody to a place that takes your breath away every sunset, we are extremely happy to share with you a sandy beach kilometers free of people, VICHAYITO in the North of our beloved Peru. At the middle of July until the end of October you will be amazed to see the Whales in their way from North to South to the Antarctica, they come closer to the shore in this privileged beach, so every day you can see them jumping with their baby whales following closer. Our dream has come true, MARCILIA is a paradise that we can share with everybody, we will be with you 24/24 your wellness is our passion, we will take care of you, and will be waiting for you to come back as the whales come back every year to show us how beautiful and magnificent life is. MARCILIA has 2 levels, the first level on one side of the street just in front of the sandy beach where BALLENATOS and PINGÜINOS” bungalow (Superior Double Bed Private) are located just in front of the sea, PINGÜINOS is a perfect rustic jewel with kitchenette for couples that wants to have a private and lonely place only for them, BALLENATOS was built on Dec 2013 and has a kitchenette and frigo bar, open your eyes and see the waves. MARCILIA's second level is in a high position on the other side of the street there you will find 'ESTRELLAS DE MAR' (Standard Double Bed Private) and 'HIPOCAMPOS' (Basic Double Bed Private). 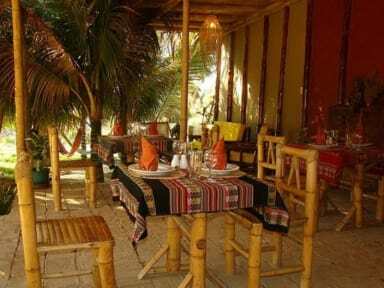 The bungalows are one next to each other, they are 70 meters away from our sandy beach, from there you have a wonderful partial view of the Pacific Ocean from your rustic furnished decks and you will enjoy every unforgettable sunset from there. 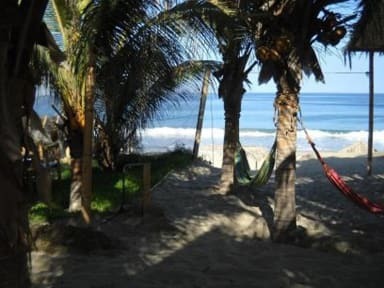 Then you have the rooms on the first floor “TORTUGAS DE MAR” and “LOBOS DE MAR”, both have a beautiful view of the ocean through the windows, ans their balconies, and at the back is located the cozy “CORALES” bungalow which has its own enchantment. MARCILIA offers you a variety Menu, plus we will be very pleased to prepare some vegetarian alternatives according to your liking and taste only tells us about it. Our WIFI access is available in the social area where our dining room is (second level). Breakfast is served from 8:30 to 10:30 in the morning, lunch is served from 13:00 hours to 15:00 hours and dinner is served from 19:00 hours to 21:00 hours. MARCILIA provides some books for its guests during their stay. Board games, beach rackets, freesbee, snorkel glasses, yo-yos and playing cards are available upon request. Early and late check in and out are possible upon availability just let us know, thank you.